What else could we talk about in our first beginner’s show, but writing! It’s foundational for being an author. If you don’t get words down on a page you’ll never reach your self-publishing goals. Being an indie author isn’t about conforming to a cookie-cutter approach, it’s about finding out what the options are and then choosing the best approach that works for you – and that’s what Michael and I are here to help with. We discuss what has helped us achieve our writing goals, which author challenges we’ve faced, and how to overcome them. We offer up simple insights for writers who want to become authors, or authors who are new to self-publishing. Watch our broadcast, listen to the podcast, or read the transcript of the show below. Each month we’ll be discussing a different aspect of the self-publishing journey from a beginning authors perspective. Jay: Hi, this is the beginners’ self-publishing salon with me, Jay Artale and my co-host, Michael La Ronn. Hello Michael. Jay: So, today we’re going to talk about writing. We’re going to look at writing tools, writing styles, and writing challenges to one of the over arching themes for this show, and upcoming shows, is there’s no right or wrong way. It’s what’s right for you. And Michael and I are going to be sharing what works for us individually. And we may not always agree. But, the goal is to share tools, tips and advice that have worked for us personally and can help you along your author journey. So, Michael, what are you currently working on? Michael: Yeah, well I’m currently thick into the writing process of my 9th and final book in my galaxy maverick space opera series. So, it’s a space opera series with lots of epic battles and it’s about 6 people who come together to save the galaxy. It’s kind of like the Avengers but with ordinary people. So, I’m putting the finishing touches on that. I should be done with it some time in the next month. And I’m looking forward to having another completed series under my belt. How about you? Jay: Excellent, well done you! Yeah, I’m working on a non-fiction and I tend to juggle a couple of different projects at the same time. So, I’m doing the finishing touches to a poetry collection. I’ve got beta-reader feedback. I’m just putting the finishing touches on that. So, switching gears between poetry and a non-fiction instructional guide at the moment. Depending on what mood I’m in at the time. Michael: That’s good, switching gears and working on multiple projects to keep that momentum going. I started reading your poetry collection and I’m really enjoying it. So, first plug for it. Jay: Oh, ok, well thank you very much. It’s, that’s my first foray into putting content out there that isn’t instructional. And that’s a very nerve racking thing, when you’re an author, to put your words out there to be judged. And that’s why I like beta-readers, because you can feed it out and you get a little bit of feedback and you can tweak it and you can tweak it and then when you’re happy with your end product, then you can get it out there for a wider audience and you feel a bit more competent. But it is, it’s a nerve racking thing isn’t it, getting your first book out there? Michael: Oh it is, it is, and that’s why you need a team of professionals to help you, beta-readers, editors, writers, it’s really, really important and critical in the writing process. Jay: Let’s look at tools Michael, what tools have worked for you and what tools do you use to write? Michael: I’m one of those technophiles, I will grab a program just to try it. But recently, I’ve alternated between Ulysses and Scrivener. So, I love Ulysses a lot, I love Scrivener a lot and I’ve switched more to Scrivener now, just because I think their mobile application is a little bit better. But I write on my Mac, so I use my Mac to write and I’ll also use Dragon to dictate. And then I also write on the Scrivener mobile application. So, I write a lot on my phone. In fact, I’d say, probably most of my stuff is written on my phone these days. Jay: Is that because of your writing schedule and you have to be flexible about when you can write or is it just that ease of use of having your phone with you all the time? Michael: It’s both, you know, I’m not in front of my desktop very often during the day, usually only in the morning and in the evenings. So, having the ability to write on my phone, gets me an extra 1000 words a day that I wouldn’t get otherwise. It’s definitely a learning process, right, to have to write on your phone [laugh]. I think a lot of people probably cringe when you hear that but I was able to get used to it and I’d probably say most of my words come from my phone these days. Jay: Well, actually I’ve just started doing a lot of walking in the morning and I’ve been using my phone, but my phone to dictate. I haven’t worked out how I’m going to get them off my phone without having to retype them. I wondered if I could hold my phone up to my Dragon and get it to dictate the words but I’m not quite sure if that will work. Michael: Well, Dragon, you should be able to use the transcription feature. I think there’s an option where you can upload your MP3’s and it will transcribe them for you. Jay: Oh my goodness, that’s fab. Michael: Yeah, it’s pretty cool. I’ve used it before and it works really, really well so, you should try it. Jay: Yeah, no, definitely, yes, get my Dragon, train my Dragon to transcribe my notes for me. Michael: As every Dragon should be trained to do [laugh]. Michael: Yeah, I saw that too, by Scott Baker. 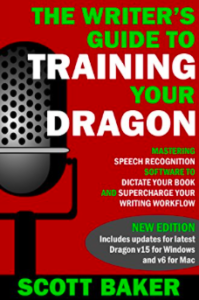 Jay: Yeah, I downloaded it, I haven’t read it yet but I thought I’m new to, well I’ve had Dragon for ages but I haven’t really used it because it is kind of a discipline and it’s retraining yourself as a writer of how do you train your Dragon. So, it’s not just training your dragon but it’s training you as a writer to go from typing the words to actually speaking them and making it seem natural. That it’s a natural process for you. Michael: It’s definitely a readjustment, like you said, it takes a discipline, it’s almost like a handicap I the beginning, you really just have to sit down and apply yourself and just say you’re going to make it work regardless of how you feel or how badly you’re doing. And you’ll get over the hump. I could talk about dictation all day, I love dictation [laugh]. But I wanted to ask you, how do you, typically, what tools do you use? Jay: Well, actually, talking about the learning curve and the hump, that’s why I didn’t use Scrivener to begin with because of that learning curve, and it’s quite a steep learning curve. But, once you get over that hump, that has revolutionized my writing. I wrote my first book in Word and it was a travel guide, a 70,000 word travel guide and moving sections around, and trying to organize the content and editing, it was a complete nightmare. And so, then I moved over to Scrivener and all of my books now, are written on Scrivener and it’s just the ease of being able to edit a document and move content around and leave little notes or to do a plotting summary using the index cards. It’s amazing. And I think having the right tools really does help increase your word count. If you are using the right tools that you like using and that you enjoy using, then they no longer become like a distraction. They become part of your writing process and help you improve your writing output. Michael: No, I absolutely agree and echo that 100%. Because, there are a lot of tools out there for writers and it’s like a good or evil thing. No tool is really good or evil, it just depends on how you use it. And so, that’s why I recommend that if you haven’t used Scrivener or you haven’t used Ulysses, or if you haven’t even used Word, try it and just see how it works. If it doesn’t work well, with the next novel, change your software. There’s really nothing to loose. Jay: So, you talked earlier about Scrivener’s iPhone app, I haven’t heard about that either. How does that work? Michael: Basically, the app is very similar and you can do almost the same things that you can do in the Scrivener desktop app, but it’s just on your phone. I can write my next chapters, I can go into the outlining function, I can add links, it’s even got a limited compile feature. So, it’s very similar to the desktop version but it’s very convenient. Like, last week we were at a department store, my wife and I were, and I didn’t want to shop [laugh], because I just, you know, I’m not a shopper. And I pulled out my phone, I sat on the couch and I wrote a chapter while I was waiting for her. And that’s a 1000 words that I would have never gotten if I hadn’t used the phone. Jay: So, where does it save to, in the cloud somewhere? Michael: Yeah, it syncs with DropBox, it connects with DropBox and it sync every time you open and close the app. So, it works very seamlessly. I’ve never had any issues with loosing any data or anything like that. It works very fast too. I mean you can tap the sync button on your phone and it’s right there on your desktop within seconds. Jay: So, then when you switch to your laptop, then you go to DropBox and start working on that same version? Michael: No, it all works within Scrivener, the DropBox syncing works behind the scenes. Jay: Oh, right, and it links the two? Michael: Yeah, it links the two and all you see is the tiny little loading screen that lets you know that the apps are syncing and then you’re off to the races. Jay: Oh great, I’m going to have to try that, I’ll let you know how it goes in the next show. Michael: It’s the best $20 I’ve ever spent [laugh]. I think it’s available on the app store all across the world but, it’s good stuff. Jay: So, when you’re writing, whether you’re on your laptop or on a phone or dictating with your Dragon, have you got a preferred writing style? Would you say you’re a plotter or a pantser? Michael: I’m a pantser all the time. I’m a pantser so much, it’s just not even funny. I can tell you, I’ve used every writing style in the book. So, in terms of outlining, plotting, I’ve written probably 25 novels, 16 or 17 of those were outlined in a different method. So, I’ve tried them all. 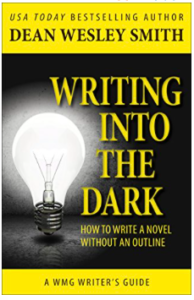 The one that has worked best for me, and this is just my personal experience, has been Writing into the Dark: How to Write a Novel without an Outline, that’s a method by Dean Wesley Smith, where it’s just pure discovery. You just sit down, and you don’t know where you’re going to go, and then you outline your book as you go. So, that’s a great book, probably not something I wouldn’t recommend for your first novel [laugh], if you’re going to write, but definitely something to look into and aspire to. How about you? Jay: Well, I read that like Lee Child, he does the same thing. He just, with a single sentence, he’ll use that as the kernel of an idea for his book. And he doesn’t know the characters, he doesn’t know where it’s going. So, he’s almost doing a voyage of discovery, the same way that the reader would do. Which kind of seems so alien to me? I think it’s a bit different for me because I don’t write fiction, I only write non-fiction. But I think I’m, I see-saw between, I do do a bit of pantsing, like when I have an idea for a book, I’ll just do a brain dump of information of the key things that I’ve thought about. And then I’ll, this is where Scrivener comes into play, being able to have the index card view. So, for each idea within the book, I’ll start a new page, it will be a new index card and then I can start moving it around and see what gaps I have in my non-fiction books and what additional content I know I need to map in there. So, I’m definitely a pantser but I think, because I’m a project manager, I like to know where I’m going. I need to know what the end goal is and I need to know the key steps along the way. And obviously there’s wiggle room within that process but, yeah, I need a goal, I need a plan [laugh]. Michael: That’s good, with non-fiction I mean, that’s pretty important because if you don’t know what the ultimate goal that you want to lead your readers to is, you know, it’s probably not going to go too well. But, where does the dictation and talking into the microphone for ideas come into play? Is that while you’re doing it or before or? Jay: Yeah, when I’m walking, I’m staying in California at the moment. So, the lady that I’m staying with, she drops me 5 miles away, at the other end of the beach, and I walk back along the beach, you know, when you’ve got no distractions, it’s just ideas coming to you. Sometimes it’s a blog post and sometimes it’s part of a book or a chapter that I thought, or a poem or something. So, I’ll just start my phone and start dictating into it. When you’re a writer, sometimes it depends on your mood, what tool works for you, what approach works for you. And as long as you are getting the ideas and being inspired, it really doesn’t matter what vehicle you use to capture them. Michael: No, absolutely and by the way, I’m jealous [laugh] that you get to walk 5 miles on the beach in California. That sounds awesome. Yeah, it’s an evolution too right? So, the tools and the strategies that you start off using are going to evolve over time. So, don’t think that ok, I’m going to plot out or do a brain dump for this book, that I have to do it this way for every single book moving forward, it’s a journey, just like your writing career is. So, that’s why I always say it’s a good idea to experiment because you never know what works for you until you try everything. Jay: So, do you use different processes, because you do non-fiction as well and you do poetry. Do you use different tools and techniques depending on what you’re writing or is it not that clear cut? Michael: Yeah, for my fiction and poetry, that’s all into the dark, I just sit down and write it, I don’t know what’s going to happen. I think it’s more fun for the reader that way too. For my non-fiction, my process is very similar to yours. I usually come up with a skeleton outline of what I’m going to write and then I figure out what those gaps are and then I just start writing. Jay: So, if you have you come across any books that will help people, whether they’re a plotter or a pantser? Anything that would inspire them to investigate one process or another? Michael: Oh absolutely, there are a couple of things. There’s a book and a video. 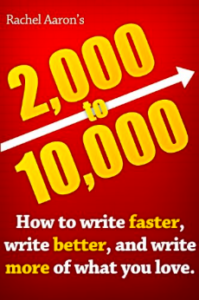 2K to 10K: How to write faster, write better, and write more of what you love by Rachel Aaron, that’s a great book for anyone just starting out or how wants to improve their writing speed? She talks about, you know, 3 major areas that you need to know in order to move forward with your novel. She talks about that and she talks about how to outline effectively, how to write effectively, it’s a great book. Have you read that? 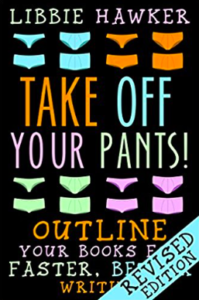 Jay: No, I haven’t read that but I was actually recommended a book by David Penny who is one of the co-hosts of our member’s Q&A podcast, it’s called Take off Your Pants, which, I just want to buy the book because of the title. Michael: It’s the greatest title ever isn’t it? Jay: Yeah, it’s by Libby Hawker and it explains the benefits and techniques of planning a story before you write. So, that’s why I thought I’d read that one because it’s very much about plotting. And I was hoping that there would be techniques in there that would help me write non-fiction, even though I think she’s written it from a fiction standpoint. Michael: No, you’re going to love that book. I think a lot of people who pick it up are going to love it because Libby Hawker and Rachel Aaron are in a way, kind of from the same school of outlining. I recommend you read the books together because if you do read them together, you get a really 3 dimensional view of that approach. Which is a very traditionally approach, right, it’s know what is going to happen before you write it, spend the time to understand where you’re characters are going to go, what the arcs are, yeah, it’s just a fantastic book. Jay: And for anybody that wants to know more about plotting and pantsing, we’ve got a couple of articles on the self-publishing advice centre blog, one is called Are You a Plotter or Pantser and what’s the Difference? And the other one was a panel discussion A Better Way to Write a Book that Debbie Young hosted at the London Book Fair, Indie Author Fringe, not this year but last year, and it was for indie authors debating each of the methods and you got a couple of pantsers and a couple of plotters there in the panel discussion. So, really, if you want to dive in and get a better understanding, that would be a good place to start as well, some good information there and some good discussion. Michael: Definitely, and I would, the last recommendation I would make is, I did a video on my YouTube channel, Author Level Up, it’s a video called How to Outline Your Novel, it’s 10 ways that you can outline, so, I talk about, there’s 10 major methods that people use to outline their novels. I go through each one of those, what the pro’s are, what the con’s are, and then some examples and some considerations that you can use in your own work. So, that’s something else that I would offer up for people to check out, if you’re interested. Jay: That sounds great, yeah, it’s really about showing people the different options available and it’s about educating indie authors about what is available and what’s out there and what’s worked for us and what we found challenges with. Because there is so much advice, and I think that’s one of the biggest challenges about being a beginner author, is there’s just so much choice out there and you can get overwhelmed by the decisions that you end up not writing because you’re still trying to find the right tool or you’re still trying to find the right method. So, the key thing is just write and then if the writing method or the writing style doesn’t work for you, then you know, try something else. Just find out what’s available and use these videos or articles to find out what your options are and then just go for it, start writing. Michael: Yeah, and speaking of challenges, challenges, they’re never going to stop, right, in your career. And that’s why you have to keep on adapting and experimenting and we all have challenges. Jay and I both have things that we continue to struggle with, even though we’ve been at this for a few years. What are some of your biggest writing challenges, Jay? Michael: Just start thinking about the next thing, yes, I’ve been there [laugh]. Michael: Yeah, no, I agree, it is tough, it is tough. Especially when you’ve got all kinds of other things going on, but that’s part of the challenge and it looks like you’ve done pretty good at it, so, it’s all part of the game. Jay: So, what would you say your biggest challenge is? Michael: My biggest challenge is, I think, for those who hang around me and know me, I think very big. So, I tend to take very big risks with my fiction. For example, my last series, The Last Dragonlord, it’s a fantasy, a dark fantasy, it’s about a ruthless Dragonlord trying to seek revenge against the conspiracy that overthrew him. Now, for fantasy readers, it’s a dragon, fantasy readers love dragons, right, but not often in fantasy do you see a dragon as a main character in the series. And so, that was an unusual risk that I took with that series. I think it ultimately paid off but I’m always trying to do weird and unusual things with all my series and so, there’s always the thought in the back of my head of, am I going off the deep end here, is this going to be the series that’s like the nail in my coffin? And, I always end up ok, so, I think my biggest fear or challenge sometimes, is myself? And so, it’s just a constant struggle to just kind of get over that critical voice and just kind of do whatever it is artistically, that I’m trying to do, while also balancing the market with the marketing, I think is a struggle for me. Jay: I think that’s a really good point because when you write your first book, it is a nerve wracking experience and you don’t know, you may have ideas but you don’t know how your idea is going to perceived and what your writing style and you’re, well, I know I was filled with self-doubt. I only wrote a travel guide but I was still worried about, you know, you’ve got all the Lonely Planets and DK Guides and all of these big guys and here am I, writing a travel guide. But I felt that I had something to say and I think, as an author, as long as you have belief in what you’re writing about, then it doesn’t matter what you’re writing, as long as you’ve got your heart and soul in it and you believe that you’re going to bring some kind of benefit to a reader and that your book needs to be read, then just write it. Michael: I love that you said that. Today, my daughter and I are going to go to a pool party and so, here in Ohio it’s very, you know, very hot. So, the pool water, it’s really cold, when you jump into the water for the first time, it’s really like, it stings, you know, like just super cold. But, once you’ve been in it for a minute, it’s fine. It’s like you’ve been in it forever. And so, I liken that to what you just said where your first book, it’s like jumping in the pool for the first time. You just have to do it and then it gets so much easier and you’ll wonder why you haven’t done it your whole life. Jay: Hmm-hmm, yeah, definitely. So, any other writing challenges? I know that one of the ones I have is just time and setting myself the time to write. And I know some people, they write in the mornings, so they set themselves like an hour or 2 hours in the morning to do their word output. But, I would love to have a writing habit but I’m kind of erratic. Michael: Yeah, I am too [laugh], I am too. It’s a, time, it’s the challenge that always comes up, doesn’t it, there’s just no way around it or a way to solve it. Jay: Do you set yourself a word count target for a day or a week or something? Michael: I try, you know, I try to shoot for 1000 to 3000 words a day, sometimes I get under that, sometimes I get well above that. It just is what it is, how about you? Jay: No I don’t, I just write [laugh]. Michael: Just write, don’t think about it. Jay: Well you know, I’m a plotter and you’d think that I’d have a target and a goal and everything but, you know, I’m a half-hearted plotter. So, I know what I want to write but then I can’t keep to a writing target, you know, I have the best intentions and in Scrivener you can set yourself a writing goal and it tells you whether you’ve reached your writing goal? And I use that, and, you know, a great thing about Scrivener is, it’s got loads of bells and whistles that you can use but, I mean, my heart wasn’t in it. So, I stopped and that’s the thing, I think, when you’re using tools, if something isn’t working for you, you’ve just got to move on and find out what is. And sometimes it’s alright to be erratic and be un-scheduled and just, as long as the, the key thing is getting words on the page and as long as you’re doing that, however you do it, whatever tool, whatever technique, whenever, as long as your words are on the page, that’s it. Michael: No, and that’s great, I have a friend, he kind of has the same problem we do and so what he did, that worked really well for him was, I’m just going to write a silly amount of words every day. So, if I’m not feeling it, I’m only going to write 25 words today [laugh], I’m only going to write 25 words and he would find out that, you know, if I do 25 words today, he usually ends up doing way more. So, sometimes setting a little goal can help you get a big goal. Jay: Well, actually, you know, another thing I don’t really like doing is going to the gym. But you say, right, I’m just going to go to the gym and I’ll just do a 10 minute workout, go there, make an effort, do 10 minutes but once you’re there and once you’re doing it, then you get carried away and you’ve been there for an hour and you’ve achieved something. So, I’m just thinking, maybe that’s a good way of writing, just say, I’m only going to write 25 words or write a paragraph and then hopefully when you write a paragraph then you’ll suddenly get inspired and that’s it, you’re off and running and you end up writing a couple of 1000 words when you never intended to. So, maybe it’s just getting yourself in front of a page and making that small commitment and see if it can grow into a bigger commitment. Michael: Yeah, sometimes you have to trick yourself, right, and sometimes it’s less about the goal and more about the system. So, what are your techniques that you can use when you don’t feel like writing? What do you do to get yourself in the mood? Or what do you do to help get through writers block faster, if that is something that strikes you regularly? Jay: Yeah, and actually Orna Ross, who hosts the Advanced Self-Publishing Salon, she introduced me to f-r-e-e-writing as a process, she uses it for her fiction and I took the method of freewriting, which is kind of like speed writing, freewriting, and I took that method to do some travel writing articles. So, I take the freewriting, which is just going 20 minutes non-stop, just writing, not thinking about it, shutting off that little critic in your head and just getting words on a page and it doesn’t matter if they’re absolute rubbish, it’s what it is, is just to get your brain and your kind of mindset into that idea of ok, it’s ready to write. And it’s almost like a warm-up exercise. You wouldn’t go and run a marathon without doing some warm-up. And that process really works for me and I actually ended up writing a book, FreeWriting for Travel Writers, to kind of help other travel writers get over that writer’s block or feeling like they’re not inspired to write. Do you have any techniques, do you use freewriting or anything like that? Michael: I used to, I used it back in the day, it was a lot of fun. I use meditation actually, as something that has been helping me over the last year. I meditate for 5 minutes every morning and I set my timer for 5 minutes and I close my eyes, I take a deep breath and I think about where am I in my work in progress? So, where did the chapter end, where are the characters, and I just clear my mind. And then once the 5 minutes are up, I go to my computer and I start writing. There’s something about clearing your mind in meditation that has just really worked for me over the last year. Jay: Yeah, that works for me to and that’s part of my freewriting process is, clearing your mind and getting yourself ready and blurting out a whole string of words. Michael: Exactly, there’s multiple ways to do it. Jay: So, I think we’re coming up to time for this episode but I just wanted to let people know that we’ve got a landing page on the self-publishing advice centre, it’s our writers page and the URL is selfpublishingadvice.org/book-writing-advice/. And on there, you’ll find a writing tips for beginner’s article and then below the articles there’s a set of instructional videos by ALLi member, Paul Teague. And he’s done these short, instructional videos about all the different writing tools available. So, he’s got videos about Vellum, Dragon, Novel-Factor, Scrivener, Google Drive and Microsoft Word. So, there’s some processes there that we haven’t discussed in the show. So, if you’re interested in just using Microsoft Word to map out and write your first novel, then go and take a look at some of those videos to see what other tools and advice are out there. And, there’s lots of writing articles on the blog as well. Debbie schedules writing related posts on a Wednesday, for Writers Wednesday. So, each week we have something around the craft of writing. Look at it, see if it’s relevant for you and if you think it would work for you or if it’s relevant for you, then have at it and try to use the tools and techniques that other ALLi members are recommending. Michael: No, absolutely. One of the important things in your author career, to get a handle on very quickly is, filtering out what works for you and what doesn’t. Jay: So, let’s wrap up the show by talking about what we’re going to be working on in the coming months. So, I’m going to be trying to wrap up my second poetry collection. This one’s a collection of Alzheimer related poetry. And so, I’m working on that and trying to get that over the line. So, that’s my focus for the next couple of months actually. I’m having illustrations drawn as well, to illustrate each poem, to try and make it a bit more light hearted than the content. Michael: No, that’s great. From what I read so far, it’s a tough topic to talk about, right, and having a light hearted feel is really good. Jay: Yeah, I wanted that balance in there. So, what are you going to be working on in the coming months? Michael: Well, I am revamping my website. So, I am looking forward to unveiling that. But, more importantly, one thing I’m doing is I am re-branding the very first book that I ever wrote. So, my book, How to be Bad, I’m re-branding that as Magic Souls. It’s getting a new title, it’s getting a new cover, it’s getting a new interior, it’s getting new marketing, new categories, key-words, you name it, I’m just basically rebuilding this book from the ground up. So, I am looking forward to getting the cover for that next month and maybe talking about that on future shows. Jay: So, are, is this part of a series or is this a stand alone book? Michael: This is a stand alone book. So, it’s a choose your own adventure for adults. It’s kind of fun. If you’ve ever read those choose your own adventure books as a kid, it’s like that but it takes you to the next level with a lot more complicated and advanced decisions. And one of the things that I did not do very well when I first launched it, is I totally mis-marketed the book. So, I marketed it as a, I don’t even remember what I marketed it as [laugh], but it’s an urban fantasy and I did not do my diligence on that and so, I think the book deserves a second chance from me and so, this is the first that I’m doing in my entire portfolio of my earlier books, as I’m going through and re-branding. It’s an expensive endeavor but it’s a really important one. Jay: And what’s the impetus behind re-branding your website? Michael: The one I had before just wasn’t very good. My very first website was a train wreck [laugh]. My second website was a dumpster fire. My third website kind of got some things right and then I scrapped it and did something that I probably shouldn’t have done, I changed themes and messed up my Google analytics and so I’m trying to get back to having a good website that’s easy for readers to get through. It just wasn’t doing that now. Jay: Yeah, well maybe, that’s a good topic for a show, helping people get their first author website up and running, that would be a good one because that’s such a key part of being an author, is having that at the forefront. Even if you’re not selling your books from your website but having this central location that people can go to, so that they can find your first book and then your next book, and all your other books after that. Michael: A virtual landing pad, so, I would love to talk about that because I can talk about all kinds of stories [laugh]. Jay: So, let’s have show, somewhere down the line, later this year, about websites and blogs and how authors can use their blogs to start connecting with their audience, even before they’ve written their first book. Michael: Deal, deal. And since we’re coming up on time, we want to ask a question to you guys, to our audience. And the question this week is, are you a plotter or are you a pantser? So, drop us a comment in the comments section below. We’d love to hear from you. And if enough people comment, you’ll also be able to see how other authors do it, which is always a great learning opportunity. For our topic next month, we are going to talk about all things editing. We’ve talked about writing, we only thought it would be a great follow-up to talk about editing, how to do it, what the different styles are, maybe working with an editor? All the things that pertain to polishing up your first book or your next book, to get it out to an audience so that they will enjoy it. So, we will talk about techniques and all things that relate to the topic of editing. As always, if you’ve enjoyed this episode, we encourage you to leave a review on your podcast network of choice, as that helps us find more great listeners like you and it also helps the other shows on our network. So, thanks for listening and we’ll see you next month. Take care, Jay. Jay Artale is a project manager who swapped corporate life for a nomadic existence as a non-fiction writer. She’s the author of travel and travel writing guides, and poetry collections. Jay is also one of the co-organizers of the Indie Author Fringe, a 3X a year online conference for indie authors who self-publish. Michael La Ronn is the author of over 30 science fiction & fantasy novels and author self-help books. To date, he has published over 1.5 million words of fiction and nonfiction. Since publishing his first book in 2014, he has produced a prolific writing portfolio while raising a family and working a full-time job in the insurance industry. I’m a new authour and I didn’t realize that how I write had a name! I’m a pantser – and proud to be. I’m writing a romance fiction book and I could not imagine plotting it out.